Break open the biscuit barrel!! The jury's still out on this one- what is a biscuit and when is it a cookie. When I learnt to bake in school ages ago, we were taught to how to bake biscuits. We learnt to make chocolate biscuits, oat biscuits, butter biscuits, ginger biscuits and so on and we had them with tea. Then came the word cookies, definitely an American word. Because the Americans already had a product called biscuit which was more like a scone. If you've read cowboy stories, you'd know that that's what cowboys ate- a stew and biscuits that were used to mop up the gravy. American biscuits used a raising agent and were soft, unlike British biscuits that were crisp and dry confections. To avoid further confusion, Americans too made crisp, dry confections and called them cookies. On August 9th, there will be a workshop on "Biscuits and Traybakes". What will be in the barrel? Thumbprint biscuits, cheese and chilli biscuits, sesame biscuits, almond and orange bars, tiny burger biscuits, melting moments, oatmeal raisin cookies (aha!! 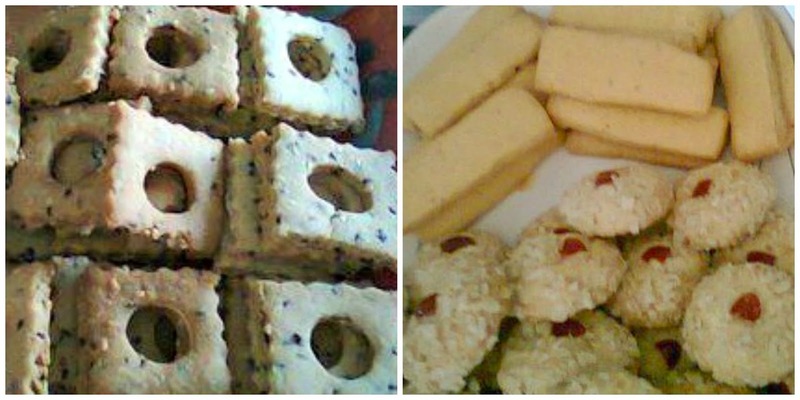 ), butter biscuits, surprise chocolate biscuits and brownie biscuits. And 2 traybakes-almond slices and choco peanutty bars. So then, what are traybakes? ?